The Yale KM series cylinder offers British Kitemarked TS007:2012 1 star security and has been tested to the British Standard BS EN1303:2005. Featuring Anti-Bump, Anti-Pick, Anti-Screw and Anti-Drill protection, this cylinder is secure by Design approved and comes with a 10 Year guarantee. Recommended for use on doors which require a high level of security against physical and manipulation attacks. The cylinders exceeds the highest European security grade CEN 5 BS EN1303:2005 and are BSI Kitemark approved - KM532920 (For a lock to be approved or recommended by British Insurance companies it needs to be to British Standard BS 3621. This would be a complete lock not just the cylinder only. The kitemark cylinder is BSI approved and offers additional security features. 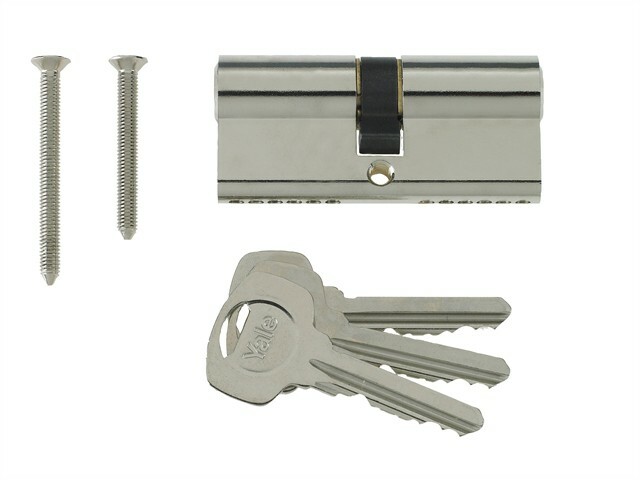 The cylinder, however, when fitted as an upgrade on it's own, would not ensure that the total lockset conforms BS3621) and they meet the requirements of PAS 024:2007 when used in conjunction with Yale security furniture . Available in a number of different lengths, all cylinders have a 10mm centre (where the locking bolt is) the dimension given are the length of each profile either side of the 10mm centre eg: a 30 x 30 double cylinder has an overall length of 70mm.